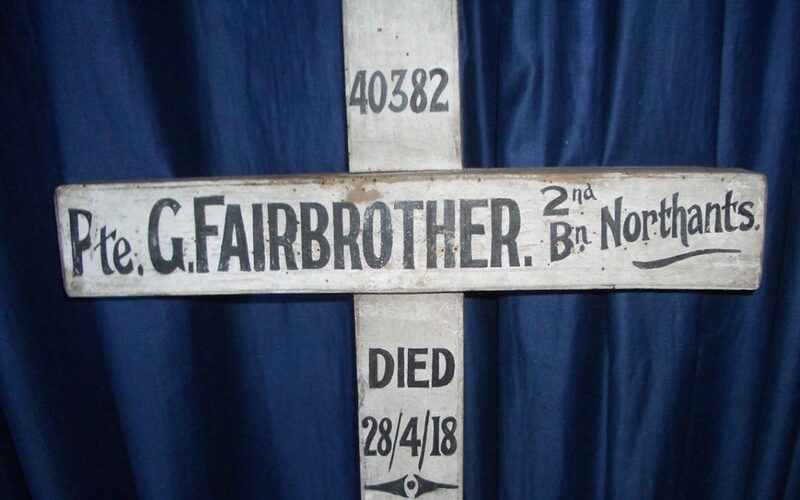 See 1918/19 photos of 2 crosses in Churchyard one of which is this one, cross now, inscription, information about George Fairbrother and the W.G.C. 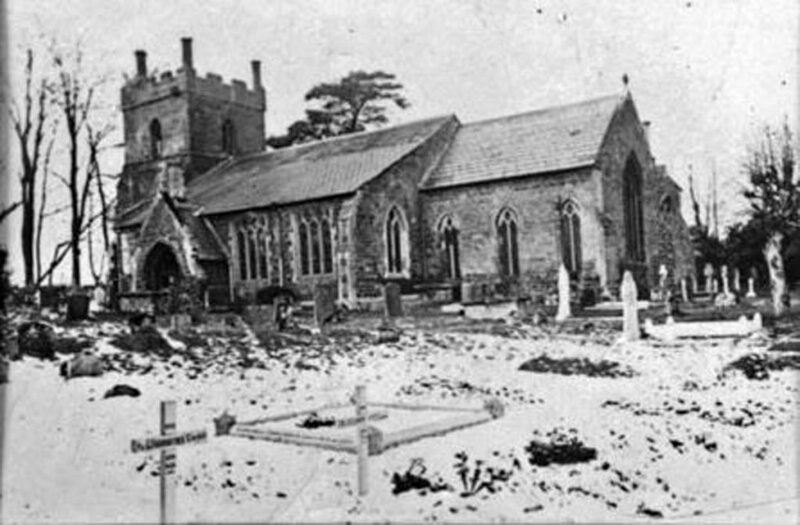 headstone which replaced the cross. George was the eldest son of William Fairbrother and Susan née Wills. William was an agricultural labourer. In 1901 the family, five children and Billy Brum their lodger, were living in three rooms in what is now the garage of 12 School Lane, Eydon. George was still living with his parents and five siblings at the time of the 1911 census and was employed as a farm labourer when he enlisted. He was clearly not a strong man as when war broke out he volunteered but was not accepted at first. 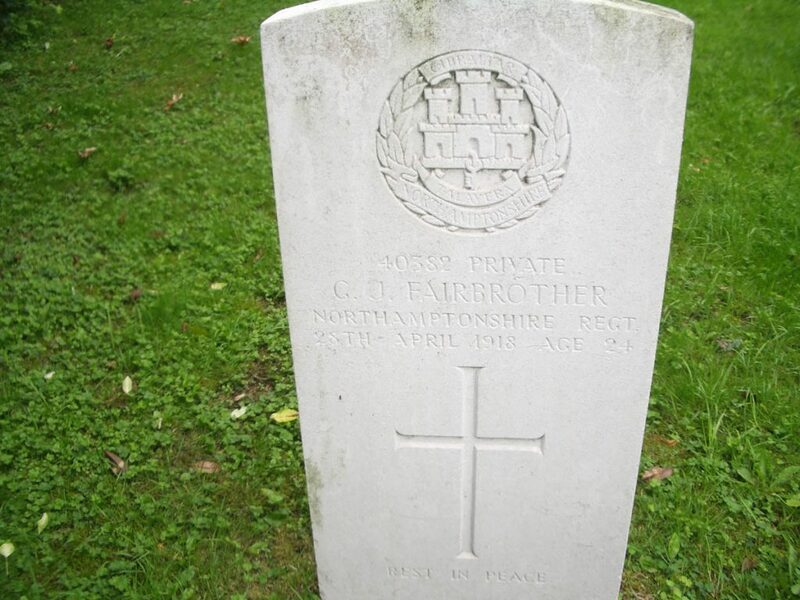 Sometime after late 1915 he was in the 2nd Battalion Northants Regiment (possibly after a spell in the Essex Regiment). He was wounded at Ypres and transferred back to England where he died of his wounds on 28th April 1918 aged 24 at the Royal Hospital in Manchester and was buried at Eydon on the 3rd May 2018. 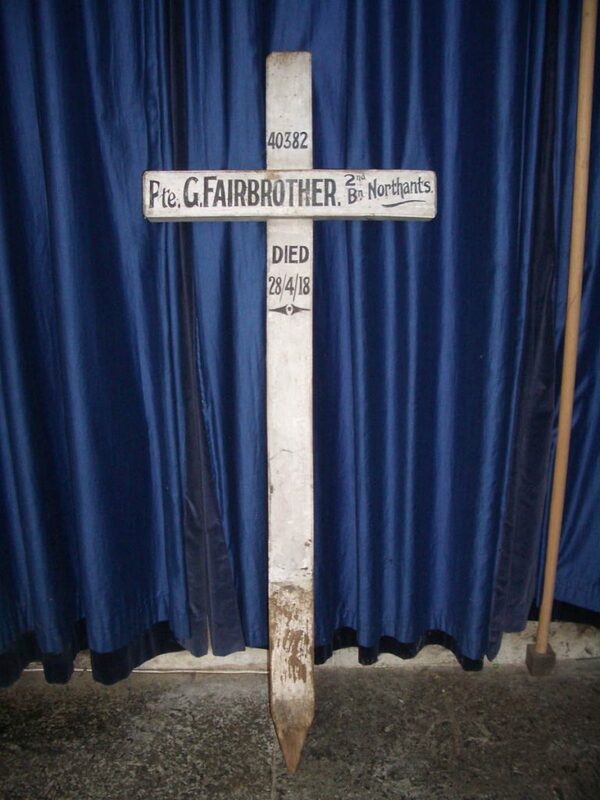 The existence of the wooden cross was not re-discovered until recent years when the house the Fairbrother family lived in for many years in the middle 1900s at 9 High Street, Eydon was sold and the new owner found the cross in an outbuilding and it was given to the Church for safe keeping. Survey and photographs courtesy of David M Kench. George was fatally wounded in the area between Licourt, Marchelepot and Ablaincourt (Somme) in the period 25-26 March 1918.